Yes it’s another lush review! I recently went into lush and as I had just been paid I had a bit of a buying binge. So expect quite a few Lush reviews to follow as I use the items. I have to be honest I love nothing more than relaxing in a luxurious bath with some help from lush. 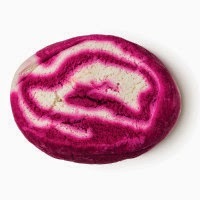 I have recently just finished using the comforter bubble bar it cost me £4.50, and is one of their pricier bath items. I picked this for it's bright colour and sweet fruity smell. I personally really love the smell hence why I bought it, but it is a very sweet smell that I think for some would induce a headache. The bubble bar lasted me for three baths but if split into quarters would easily last four. When crumbled into running water the bubble bath creates lots of foamy bubbles and gives a gorgeous deep pink colour. I have to be honest though even though I used half of the bubble bar I felt the smell was not as strong as I had hoped. The production of the bubbles doesn't seem to be altered by using less, but the colour does drop from a deep pink to a paler pink. Unfortunately the strength of the smell also decreases. A little tip I find useful for producing maximum bubbles more rapidly, is to use a shower head and spray over the bath water. I really love the amount of bubbles produced and the colour the water turns too. However for £4.50 I don't think it's amazing value. I feel the smell doesn't linger long enough and I felt no benefits for my skin. You can definitely get four decent baths out of it but for me, I personally think two is my limit as splitting into quarters greatly affects the smell. I do like this bubble bar and would be happy to receive it as a present as it does produce nice foamy bubbles and does smell good. For the price though I would not purchase it again for myself. Do I think the comforter bubble bar would make a good present? As long as the person likes very sweet fruity smells and enjoys baths.